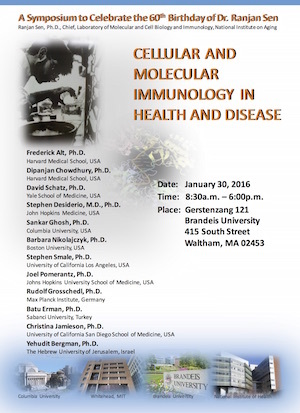 The Biology department is cosponsoring an all-day symposium “Cellular and Molecular Immunology in Health and Disease” on Saturday, January 30. The symposium will be held in Gerstenzang 121 from 8:30 am to 6:00 pm. This symposium celebrates Ranjan Sen’s 60th birthday and is organized by Sen’s Brandeis alumni. This symposium is open to the public, although the breakfast and lunch are by invitation only and are not open to the public. More information about this event is available. Whole bunch of seminars and award lectures coming up in the next week. Steven Reppert from U. Mass. talks today at 4 about monarch butterfly migration and its relationship to the circadian clock. On Monday at noon, Giovanni Bosco (PhD in Mol Cell Biol, Brandeis, 1998) will talk about condensins and global chromosome structure. On Tuesday, we have the 39th Annual Rosenstiel Award lectures at 4. Jules Hoffman and Ruslan Medzhitov will get award “for their elucidation of the mechanisms of innate immunity”. Next Wednesday we have the Heart Research Series lecture. Monty Krieger, Whitehead Professor of Molecular Genetics at MIT, will talk about cholesterol, genetics, and heart disease. Finally, next Thursday will have Josh Tenenbaum from MIT speaking in the Psychology Colloquium about “How to Grow a Mind”. Details (time, room number) about upcoming seminars are always available in the Seminars widget in the left-hand column on this blog.